The newspaper article was published. I am so happy and thankful. It was an awesome opportunity. 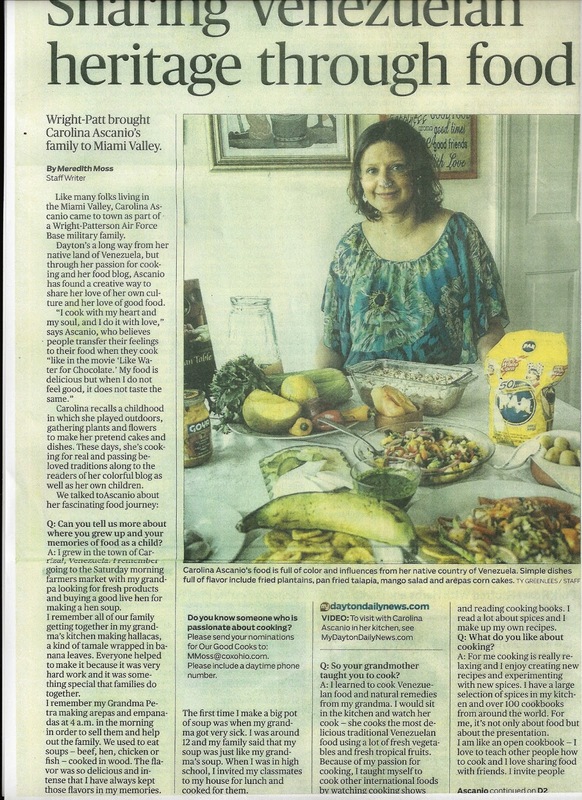 I want to thank to Meredith Moss, the person who came to my house for the pictures and video ((I apologize I do not remember his name), and to the Dayton Daily for give me the opportunity to share my cooking. Muchisimas Gracias-Thank you so much! May 27–Like many folks living in the Miami Valley, Carolina Ascanio came to town as part of a Wright-Patterson Air Force Base military family. Dayton’s a long way from her native land of Venezuela, but through her passion for cooking and her food blog, Ascanio has found a creative way to share her love of her own culture and her love of good food. Carolina recalls a childhood in which she played outdoors, gathering plants and flowers to make her pretend cakes and dishes. These days, she’s cooking for real and passing beloved traditions along to the readers of her colorful blog as well as her own children. Q. Can you tell us more about where you grew up and your memories of food as a child? A. I grew in the town of Carrizal, Venezuela. I remember going to the Saturday morning farmers market with my grandpa looking for fresh products and buying a good live hen for making a hen soup. I remember all of our family getting together in my grandma’s kitchen making hallacas, a kind of tamale wrapped in banana leaves. Everyone helped to make it because it was very hard work and it was something special that families do together. I remember my Grandma Petra making arepas and empanadas at 4 a.m. in the morning in order to sell them and help out the family. We used to eat soups — beef, hen, chicken or fish — cooked in wood. The flavor was so delicious and intense that I have always kept those flavors in my memories. The first time I make a big pot of soup was when my grandma got very sick. I was around 12 and my family said that my soup was just like my grandma’s soup. When I was in high school, I invited my classmates to my house for lunch and cooked for them. Q. So your grandmother taught you to cook? A. I learned to cook Venezuelan food and natural remedies from my grandma. 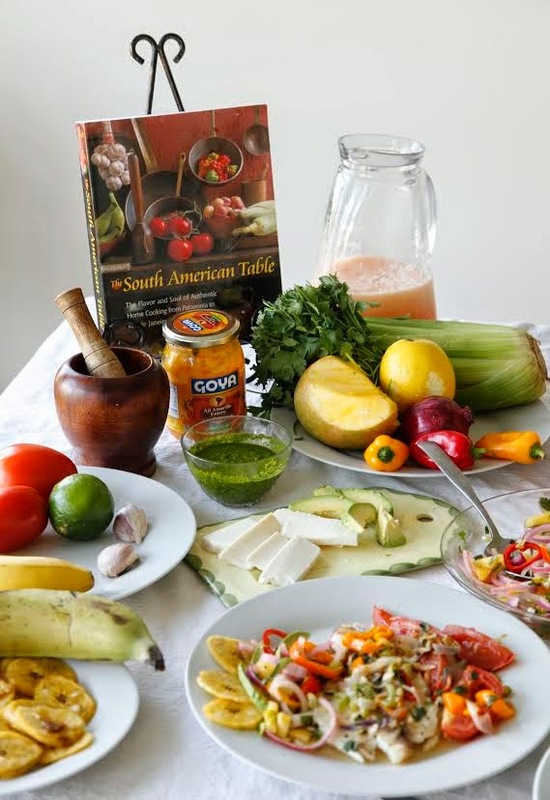 I would sit in the kitchen and watch her cook — she cooks the most delicious traditional Venezuelan food using a lot of fresh vegetables and fresh tropical fruits. Because of my passion for cooking, I taught myself to cook other international foods by watching cooking shows and reading cooking books. I read a lot about spices and I make up my own recipes. Q. What do you like about cooking? A. 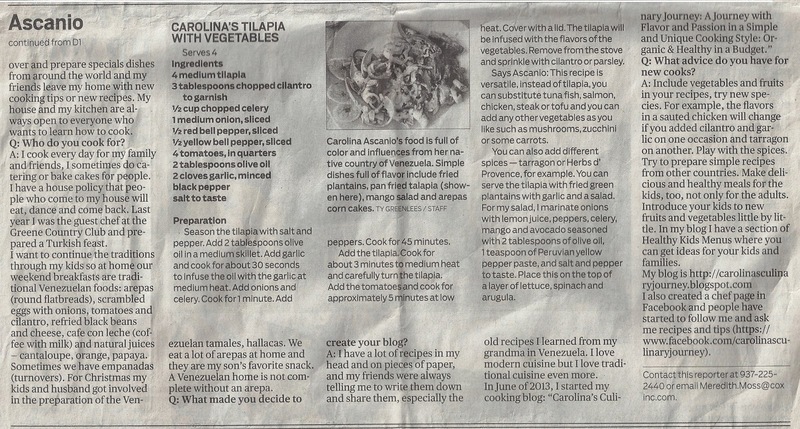 For me cooking is really relaxing and I enjoy creating new recipes and experimenting with new spices. I have a large selection of spices in my kitchen and over 100 cookbooks from around the world. For me, it’s not only about food but about the presentation. I am like an open cookbook — I love to teach other people how to cook and I love sharing food with friends. I invite people over and prepare specials dishes from around the world and my friends leave my home with new cooking tips or new recipes. My house and my kitchen are always open to everyone who wants to learn how to cook. Q. What are some of your goals related to cooking? A. One day I’d love to be in a cooking contest on the Food Network or have a cooking television program to teach people how to cook healthy, economic and easy recipes. And it would be great to be on a radio station where people call you for cooking suggestions. A lot of times my friends call me to asked me for a recipe. Back in February I participated in a cook-off at the Culinary Art Institute and did great. A. I cook every day for my family and friends, I sometimes do catering or bake cakes for people. I have a house policy that people who come to my house will eat, dance and come back. Last year I was the guest chef at the Greene Country Club and prepared a Turkish feast. I want to continue the traditions through my kids so at home our weekend breakfasts are traditional Venezuelan foods: arepas (round flatbreads), scrambled eggs with onions, tomatoes and cilantro, refried black beans and cheese, cafe con leche (coffee with milk) and natural juices — cantaloupe, orange, papaya. Sometimes we have empanadas (turnovers). For Christmas my kids and husband got involved in the preparation of the Venezuelan tamales, hallacas. We eat a lot of arepas at home and they are my son’s favorite snack. A Venezuelan home is not complete without an arepa. Q. What made you decide to create your blog? A. I have a lot of recipes in my head and on pieces of paper, and my friends were always telling me to write them down and share them, especially the old recipes I learned from my grandma in Venezuela. I love modern cuisine but I love traditional cuisine even more. Q. What kinds of foods do you share on your blog? A. I use organic products whenever possible, I use a lot of fresh vegetables, and I make meals that are not expensive. For example, I’ll make a black bean soup, or a vegetable casserole or a chicken with vegetables. You don’t even need a big piece of chicken, you can use a small piece with vegetables and a salad and you have a complete and healthy meal. 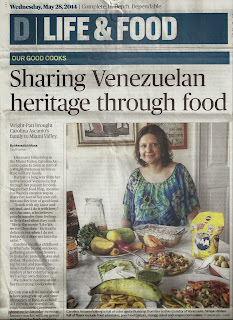 I share Venezuelan recipes because that is my heritage and I also share international recipes because we live in a multicultural environment and it’s nice to give others the opportunity to try dishes from other countries. It’s a way for people to learn about other cultures, and I love that — I am a multicultural person. Sometimes I share pictures from our travel overseas since people may not have the opportunity to visit those places and see how beautiful they are and learn about their foods and their culture. We have lived in Germany, Turkey and Switzerland and in Florida and Virginia. Some of my recipes are in English, others are Spanish and some are both. Some show step-by-step pictures of the recipe because that helps make cooking easier for a lot of people, and I’ve also started doing cooking videos on my blog. One day, I dream of publishing a cookbook. Q. What advice do you have for new cooks? A. Include vegetables and fruits in your recipes, try new species. For example, the flavors in a sauted chicken will change if you added cilantro and garlic on one occasion and tarragon on another. Play with the spices. Try to prepare simple recipes from other countries. Make delicious and healthy meals for the kids, too, not only for the adults. Introduce your kids to new fruits and vegetables little by little. In my blog I have a section of Healthy Kids Menus where you can get ideas for your kids and families.